The Girl They Call Es: Event: Show & Tell Benefit Concert presented by Glendino, 84Area, ATLjunkie, & thegirlEs! Event: Show & Tell Benefit Concert presented by Glendino, 84Area, ATLjunkie, & thegirlEs! ATLANTA!!! The holidays are here and with Glendino, 84Area, ATLjunkie, and myself, we are trying to set off the holiday season in a big way!!! We present to you, the Show & Tell:Benefit Concert! 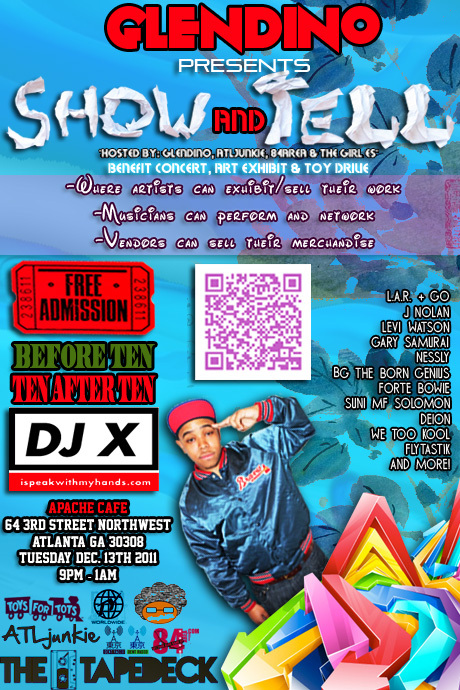 It's going down on December 13th, at the Apache Cafe here in Atlanta! It's a great opportunity for artists, bloggers, fashion brands, and everyone in between to enjoy good music and good vibes for a good cause!!! Artists performing include, Forte Bowie, Born Genius, Suni MF Solomon, Deion, Pharoh, SUNMiT, and much more!!! It's gonna be awesome!!! Yes, I said awesome! Proceeds from the event go to Toys For Tots, so bring unwrapped, unopened toys or money for the kids! So Mark your calendars, save the date in your phone, tell all your friends to do the same, because ATL we need you there with us on the 13th!!! More details below!!! WHO: L.A.R+GO, Born Dreamers, Levi The Jedi, Gary Samurai, Nessly, BG The Born Genius, Forte Bowie, Suni MF Solomon, Deion, FLYTASTIK, Pharoah, SUBMiT, Just Sincere, & more! "Hosted by: Glendino, ATLJunkie, 84Area & thegirlEs"
WHY: We collectively feel that it's important to give back to our community, be socially aware & be proactive in doing so. Our way of giving back will be through great performances, amazing art & a beautiful atmosphere full of wonderful people to network with. In addition, part of our proceeds will be donated to "HOSEA Feed The Hungry", a nonprofit organization that assists the less fortunate, feeds the homeless & gives people in our community hope and a helping hand. HOW: Come TOGETHER, properly promote and make this event work! A lot of hands are working towards our common goal & mantra which is "give back". ALL ARTISTS, MUSICIANS, BLOGGERS & CREATIVE PEOPLE WELCOME!